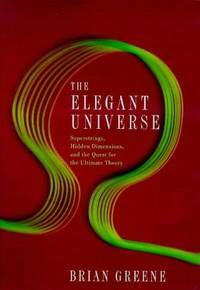 The Elegant Universe is a book by Brian Greene published in 1999 which introduces string theory and provides a comprehensive though non-technical assessment of the theory and some of its shortcomings. Scranton, Pennsylvania, U.S.A.: W W Norton & Co Inc. New. 2003. Hardcover. 0393058581 . *** FREE UPGRADE to Courier/Priority Shipping Upon Request *** - *** IN STOCK AND IMMEDIATELY AVAILABLE FOR SHIPMENT - FLAWLESS COPY, PRISTINE, NEVER OPENED -- 464 pages; clean and crisp, tight and bright pages, with no writing or markings to the text. -- DESCRIPTION: A new edition of the New York Times bestsellernow a three-part Nova special on PBS-TV coming in Fall 2003: a fascinating and thought-provoking journey through the mysteries of space, time, and matter. Now with a new preface (not in any other edition) that will review the enormous public reception of the relatively obscure string theorymade possible by this book and an increased number of adherents amongst physicistsThe Elegant Universe "sets a standard that will be hard to beat" (New York Times Book Review). Brian Greene, one of the world's leading string theorists, peels away the layers of mystery surrounding string theory to reveal a universe that consists of eleven dimensions, where the fabric of space tears and repairs itself, and all matterfrom the smallest quarks to the most gargantuan supernovasis generated by the vibrations of microscopically tiny loops of energy. Today physicists and mathematicians throughout the world are feverishly working on one of the most ambitious theories ever proposed: superstring theory. String theory, as it is often called, is the key to the Unified Field Theory that eluded Einstein for more than thirty years. Finally, the century-old antagonism between the large and the small-General Relativity and Quantum Theory-is resolved. String theory proclaims that all of the wondrous happenings in the universe, from the frantic dancing of subatomic quarks to the majestic swirling of heavenly galaxies, are reflections of one grand physical principle and manifestations of one single entity: microscopically tiny vibrating loops of energy, a billionth of a billionth the size of an atom. In this brilliantly articulated and refreshingly clear book, Greene relates the scientific story and the human struggle behind twentieth-century physics' search for a theory of everything. Through the masterful use of metaphor and analogy, The Elegant Universe makes some of the most sophisticated concepts ever contemplated viscerally accessible and thoroughly entertaining, bringing us closer than ever to understanding how the universe works. Scranton, Pennsylvania, U.S.A.: W W Norton & Co Inc. New. 2003. Hardcover. 0393058581 . *** FREE UPGRADE to Courier/Priority Shipping Upon Request *** - *** IN STOCK AND IMMEDIATELY AVAILABLE FOR SHIPMENT - FLAWLESS COPY, AVOID WEEKS OF DELAY ELSEWHERE. -- clean and crisp, tight and bright pages, with no writing or markings to the text. 1999-02-25. New. Ships with Tracking Number! INTERNATIONAL WORLDWIDE Shipping available. Buy with confidence, excellent customer service! Vintage Books. PAPERBACK. 009928992X Brand new book.Buy with confidence. Money Back Guarantee.Expedite Shipping Available. International shipment available. . New. W W Norton & Co Inc.. Hardcover. B002JMH91A . Good. 2005-03-06. New. Ships with Tracking Number! INTERNATIONAL WORLDWIDE Shipping available. Buy with confidence, excellent customer service! 1999-07-04. New. Ships with Tracking Number! INTERNATIONAL WORLDWIDE Shipping available. Buy with confidence, excellent customer service! 2010-08-03. New. Ships with Tracking Number! INTERNATIONAL WORLDWIDE Shipping available. Buy with confidence, excellent customer service! 2000-07-06. Good. Ships with Tracking Number! INTERNATIONAL WORLDWIDE Shipping available. May not contain Access Codes or Supplements. May be ex-library. Shipping & Handling by region. Buy with confidence, excellent customer service! 1999-02-25. Good. Ships with Tracking Number! INTERNATIONAL WORLDWIDE Shipping available. May not contain Access Codes or Supplements. May be ex-library. Shipping & Handling by region. Buy with confidence, excellent customer service! Vintage Books. PAPERBACK. 0375708111 Signed 8th printing, Vintage soft cover, 1999. Near Fine, w/ clean text, tight binding, straight and uncreased spine. Appears to have never been read. Very light edgewear, light cover curl. Signed by author on title page. Free delivery confirmation. . Fine. Chatto Bodley Head & Cape, 1999-02-11. Hardcover. Used:Good. W. W. Norton & Company. PAPERBACK. 039333810X New Condition. . New. W W Norton & Co Inc. Hardcover. 0393046885 New Condition. . New. Vintage Books. PAPERBACK. 0375708111 New Condition. . New. Turtleback Books. SCHOOL & LIBRARY BINDING. 0613250028 New Condition. . New. Jonathan Cape. Hardcover. 0224052993 New Condition. . New. 2010-08-03. Good. Ships with Tracking Number! INTERNATIONAL WORLDWIDE Shipping available. May not contain Access Codes or Supplements. May be ex-library. Shipping & Handling by region. Buy with confidence, excellent customer service! 1999-07-04. Good. Ships with Tracking Number! INTERNATIONAL WORLDWIDE Shipping available. May not contain Access Codes or Supplements. May be ex-library. Shipping & Handling by region. Buy with confidence, excellent customer service! W. W. Norton & Company. Hardcover. 0393058581 New Condition *** Right Off the Shelf | Ships within 2 Business Days ~~~ Customer Service Is Our Top Priority! - Thank you for LOOKING :-) . New. W. W. Norton & Company. PAPERBACK. 039333810X . New. 2014. NORTON. New. 8.4 x 7.26 cm. W. W. Norton & Company, New York: 1999. Softcover. Good condition. Brian Greene, one of the world's leading string theorists, peels away the layers of mystery surrounding string theory to reveal a universe that consists of eleven dimensions, where the fabric of space tears and repairs itself, and all matterÑfrom the smallest quarks to the most gargantuan supernovasÑis generated by the vibrations of microscopically tiny loops of energy. Today physicists and mathematicians throughout the world are feverishly working on one of the most ambitious theories ever proposed: superstring theory. String theory, as it is often called, is the key to the Unified Field Theory that eluded Einstein for more than thirty years. Finally, the century-old antagonism between the large and the small - General Relativity and Quantum Theory - is resolved. String theory proclaims that all of the wondrous happenings in the universe, from the frantic dancing of subatomic quarks to the majestic swirling of heavenly galaxies, are reflections of one grand physical principle and manifestations of one single entity: microscopically tiny vibrating loops of energy, a billionth of a billionth the size of an atom. In this brilliantly articulated and refreshingly clear book, Greene relates the scientific story and the human struggle behind twentieth-century physics' search for a theory of everything. Through the masterful use of metaphor and analogy, The Elegant Universe makes some of the most sophisticated concepts ever contemplated viscerally accessible and thoroughly entertaining, bringing us closer than ever to understanding how the universe works. "Brian Greene skillfully describes how the amazing theories of relativity and quantum mechanics transformed our understanding of nature in the last century..." - Edward Witten, Institute for Advanced Study, Princeton University. Includes an Index. Turtleback, 2000-03-01. School & Library Binding. Used:Good. 2005-03-06. Good. Ships with Tracking Number! INTERNATIONAL WORLDWIDE Shipping available. May not contain Access Codes or Supplements. May be ex-library. Shipping & Handling by region. Buy with confidence, excellent customer service! W W Norton & Co Inc. Hardcover. 0393046885 Like New Condition. . Fine. Vintage Books. PAPERBACK. 0375708111 Like New Condition. . Fine. W. W. Norton & Company. PAPERBACK. 039333810X Like New Condition. . Fine. Jonathan Cape. Hardcover. 0224052993 Like New Condition. . Fine. W.W. Norton & Company, 2003. Hardcover. New. Special 20% discount on this book. W. W. Norton & Company. Hardcover. 0393058581 Special order direct from the distributor . New. W. W. Norton & Company. Used - Good. Ships from the UK. Shows some signs of wear, and may have some markings on the inside. 100% Money Back Guarantee. Your purchase also supports literacy charities. WILEY, 2018. .. Brand New. Orders usually ship within 1-2 business days. We use FAST SHIPPING via FEDEX/UPS/DHL and deliver within 3-5 business days with tracking number, no shipping to PO BOX, APO, FPO addresses. Kindly provide phone number for expedite delivery. 100% Customer satisfaction guaranteed! W. W. Norton & Company, 2003-10-20. 0002-. Hardcover. Used:Good. W. W. Norton & Company, 1999-02. Paperback. New. BRAND NEW IN SHRINK WRAP. Book has slight shelf wear from storage(Similar to what you see at retail chains); otherwise the book is in excellent condition. Penguin Random House, 2005. Paperback. New. W. W. Norton & Company. Hardcover. 0393058581 . New. W. W. Norton & Company, 2003-10-17. Hardcover. Good. W. W. Norton & Company. Hardcover. 0393058581 Remainder mark . Fine. W. W. Norton & Company, 2003-10-17. First Edition. Hardcover. Very Good/Very Good. An exceptional hardcover with a crisp dust jacket, a tight binding and an unmarked text. First edition, with a full number line. From a private smoke free collection. Shipping within 24 hours, tracking number and delivery Confirmation. VINTAGE. New. Very good condition. W. W. Norton & Company, 2010-10-11. Paperback. Good. Jonathan Cape Ltd. Used - Like New. Hardcover w / dustjacket. Like new; no internal markings; has only lost its Brand New shine. No pricing stickers. No remainder mark. DJ nearly fine. Stored in sealed plastic protection. In the event of a problem we guarantee full refund. 1999. Hardcover w / dustjacket.